We are honored to be one of the featured breweries the 32nd annual Oregon Brewers Festival event this summer, Wednesday, July 24 to Saturday, July 27 (NOTE: No Sunday this year). The event takes place at Tom McCall Waterfront Park in downtown Portland. Taps are open from Noon to 9 pm daily. For the first time in the festival’s history, the event will serve craft beers and ciders solely from the great state of Oregon! Explore the variety of flavors and styles created by Oregon craft brewers and cider makers, with 80 breweries and eight cider houses represented. The majority will be pouring first-release products never before tasted. The Oregon Brewers Festival is not a ticketed event, and there is no admission charge to enter the festival grounds. In order to consume beer, you purchase a tasting package for $20 that includes a 2019 souvenir tasting mug and 10 tasting tokens. Patrons pay four tokens for a full 12 oz mug of beer or cider, or one token for a 3 oz taste. The purchase of mugs and tokens is made on-site (with the exception of a handful of places that will sell them locally up to two weeks prior, follow this event to find out where and when). Additional tokens are $1 apiece. The event is cash-only, with eight ATMs located on-premise. The Oregon Brewers Festival encourages responsible drinking and urges patrons to take the Tri-Met MAX Light Rail, which has a station just one block away from the main entrance. Attendees can also take advantage of the Hopworks Urban Brewery secure bike corral. The Crater Lake Soda Garden provides complimentary handcrafted root beer and soda to minors and designated drivers; minors are allowed into the event all hours when accompanied by a parent. NO ANIMALS ARE ALLOWED. 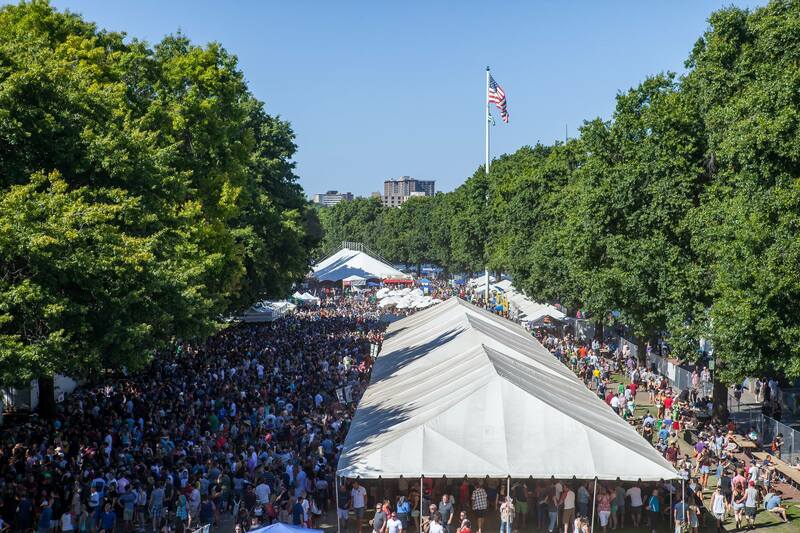 Follow @OregonBrewfest on social media, using hashtags #OBF19. Visit the event website at www.oregonbrewfest.com to learn more.